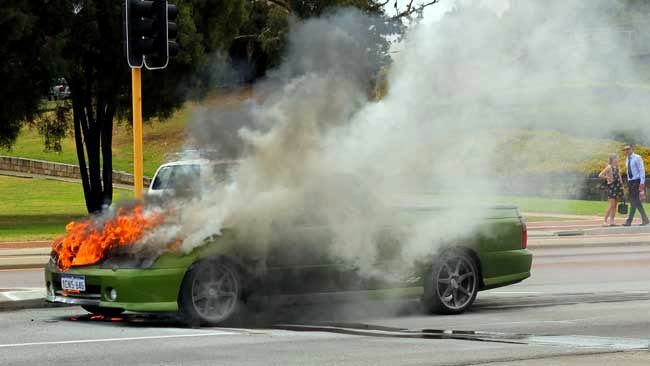 Holden's Commodore has suffered an embarrassing fire while being used as the pace car for the American Nascar race series in Daytona. Wearing Chevrolet badges – the car is sold as a Chevrolet SS in the US – and covered in Chevrolet “bowtie” badges the road car also had flashing lights was leading a field of Nascar race cars while an incident was being cleared on the track when the cabin suddenly filled with smoke and flames appeared from the boot. The driver and his passenger quickly moved the V8-powered car – which is almost identical to the Commodore sold here - to the side of the track and appeared to be heading towards one of the fire trucks on hand at race meetings, but the thick smoke in the cabin forced them to stop the car and get out. The fire was quickly extinguished but the car was not used again for pace car duties, with a replacement called in for duties. 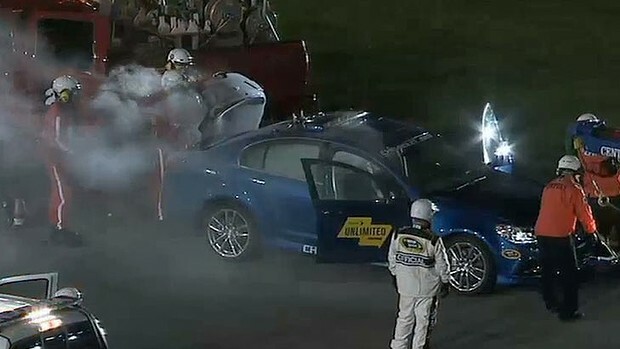 While it hasn't been confirmed what caused the fire Chevrolet appears to be distancing itself from the cause of the fire, pointing to modifications made to the car by organisers using it for the Nascar series. A General Motors statement pointed to modifications made in the boot of the car to accommodate a battery to power the flashing lights on the roof. The statement appears to be backed up by some social media comments. One person, “Slugger Labbe”, who was apparently working at the track tweeted: “I am happy to report that the @TeamChevy pacecar had a battery pack in the trunk for the external safety lights and that is what caught fire”. Most vehicle fires start beneath the bonnet due to a fluid leak of some sort. And the Chevrolet's fuel tank is under the rear seat, not in the boot, where it appears the fire started. Holden has been contacted for comment. Until now the Chevrolet SS had enjoyed a dream run in the US Nascar series. While there were some crashes along the way the race versions winning the 2013 Sprint Cup championship. The Chevrolet SS racer also won its opening race. The road-going versions - which are produced in Holden's soon-to-close South Australian production line before being exported to the States – have also received plenty of praise from Chevrolet fans happy to see a high-performance Chevrolet V8 sedan back on sale. When I first heard of this instantaneously I thought wats a piece of crap! After reading it became clear! I never knew holden imported to America. So it was the non factory electrical install that failed? i was laughing at first thinking "CRAP CAR" untill i read more..
Go to 2.23 and watch this caprice get wiped out! I wonder what the electrical fault was? I remember the VEs getting a recall for maintenance within 6 months, somthing to do with faulty fuel lines..